Manifestació espanyolista a Barcelona. Foto: Jordi Borràs. In Spain’s name In three months, anti-independence activists have been behind 139 violent incidents in Catalonia, 86 of them physical aggressions. Vandalism, insults, threats and beatings are just some of the Spanish unionist-inspired attacks that were seen in autumn 2017, especially after 1 October. Although the perpetrators are a small minority among all the people who have come out in favour of Spanish unity, the violence cuts across boundaries and has set the tone in a great many of the mobilisations by antiindependentists. 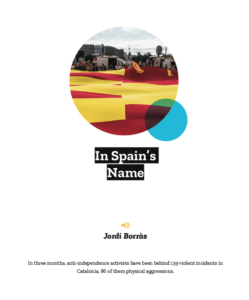 Far-right militants have been behind a great many incidents, but by no means all of them: in many cases, the only common denominator among the aggressors is the display of pro-Spain symbols or slogans. 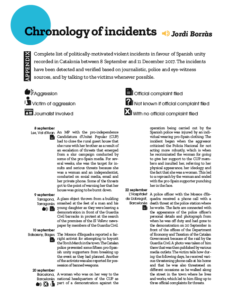 The majority of the Madrid-based media have ignored these aggressions and fed an anti-Catalanist narrative that has made them even more immune from punishment. Between 8 September and 11 December, at least 139 violent incidents took place in Catalonia that were politically motivated in defence of the unity of Spain (without including the actions of the Spanish police on and around 1 October to prevent the referendum from going ahead). The majority of these (86) were physical aggressions, which caused a total of 101 victims with injuries of varying degrees of consideration. The remaining offences were of a range of types, although primarily we find threats, intimidation, vandalism, damage to private property and at least two cases of sexual violence. Click on the image to read the report. Click on the image to read the appendix. Original version (in Catalan): here. This report was published in February 2018 in Mèdia.cat’s Media Blackouts Yearbook, a project that every year brings attention to issues that have been silenced by corporate mainstream media. Help us to publish more investigations like this! Buy the Mèdia.cat Yearbook online or in your nearest bookshop (available in Catalan). (Gràcia, Barcelona, 1981). Fotoperiodista i il·lustrador freelance, membre del Grup Barnils. Actualment col·labora, entre altres mitjans, amb El Món, El Temps, Crític i la revista basca Argia. Ha dedicat part de la seva obra professional a investigar l’extrema dreta i el nacionalisme espanyol a Catalunya. Ha publicat quatre llibres: Warcelona: Una història de violència (Pol·len edicions, 2013), Plus Ultra. Una crònica gràfica de l’espanyolisme a Catalunya (Pol·len edicions, 2015), Desmuntant Societat Civil Catalana (Saldonar, 2015) i La cara B del procés (Pagès editors, 2016).